Several new movies made its premiere on November 3, Friday, a holiday in Japan. At no. 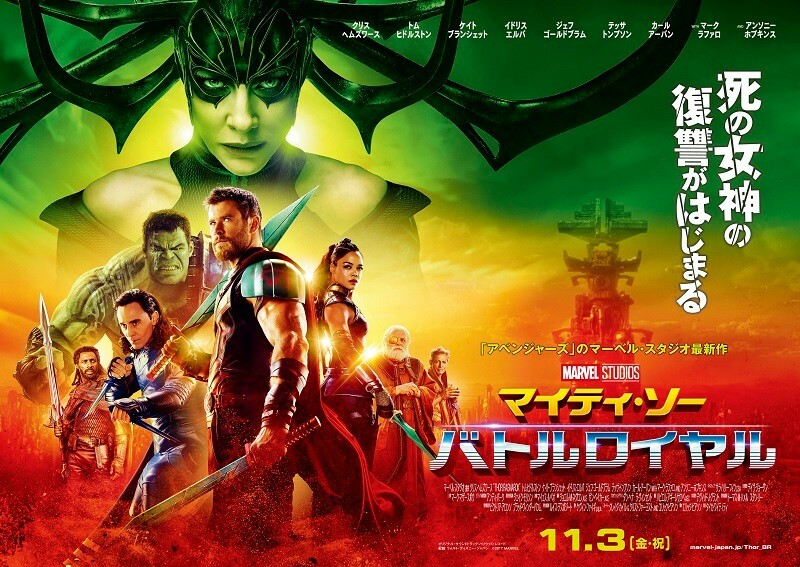 1 is Thor: Ragnarok with opening weekend numbers of 148,890 viewers and ¥230,616,800 revenue. This is 23.3% higher than the previous movie “Thor: The Dark World” (2014). Including Friday, the film earned a total of ¥397,972,300. Horror film IT is at no.2 with 138,110 viewers (¥184,492,900). The movie is seen by teens, couples and in groups. Although there is a difference in the number of allocated screens, the number of viewers per screen exceeds “Thor: Ragnarok”. Its 3 day total revenue is ¥283,750,200. Last Recipe: Kirin no Shita no Kioku opened at no. 3. Arashi’s Ninomiya Kazunari and Director Takita Yojiro (Departures) collaborates for the first time in the movie. The film attracted 107,000 viewers (¥137,568,800) on opening weekend, 43.5% lower than Ninomiya’s previous film “Haha to Kuraseba”. It had a huge opening day on Friday, November 3 and ranked first, which brings its 3 day total to ¥292,549,100. For other new releases, Hyouka live action film starring Yamazaki Kento and Hirose Alice ranked out of top 10. The film opened on 225 screens with a 3 day total of 39,084 viewers and ¥52,085,800 revenue.